Teamie's integration with Google Drive gives you the flexibility to attach documents (such as word document, sheets, pdf's and more) from your Google Drive directly to Teamie posts, lessons and assessments very quickly. It also provide instructors a way to add certain access privileges to the files and determine who can view, edit or comment on the shared documents. Instructors also have the ability to not only view the document, but also comments along the way and share feedback in real time. It is recommended to login with your Google account to use Google Integration feature effectively. For additional information about logging in with your Google account, see section, “Logging in with your Google account”. 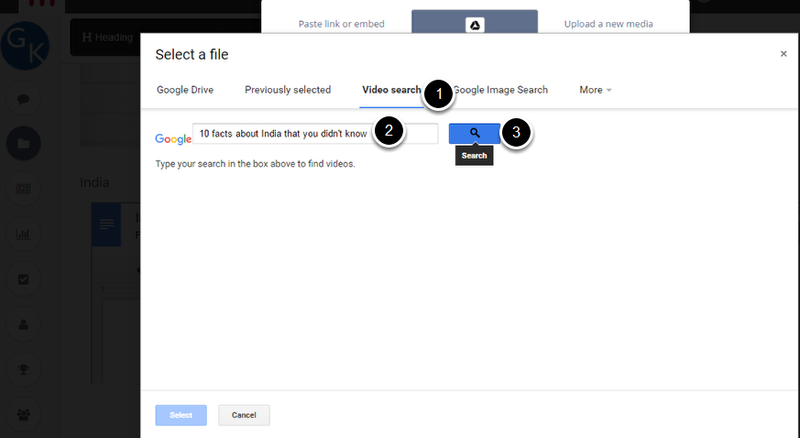 You can refer to the following video for more information about uploading a Google Document in a post. 1. On your homepage, hover your cursor over a classroom that will highlight different labels (Posts, Materials, Dashboard and Gradebook) and then click Materials to view a list of lessons and assessments created in that classroom. 2. From the Materials page, click on a lesson. 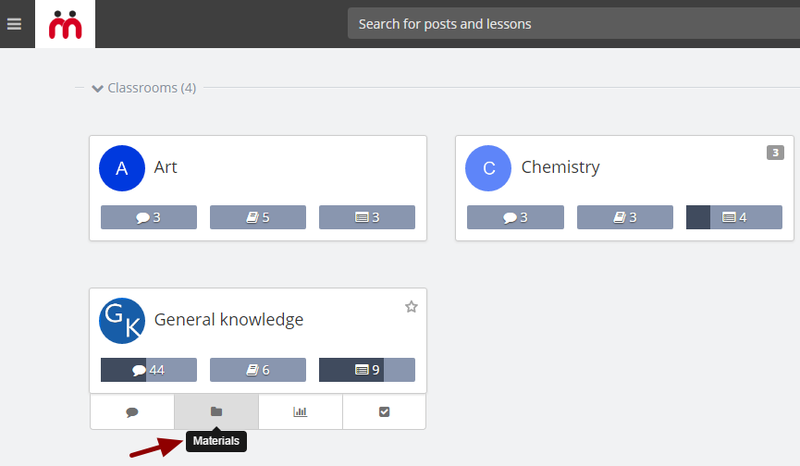 Tip: You can filter all the lessons in the classroom by clicking the "Lessons" tab. 3. Click a Lesson Page. 4. Click Edit at the top right corner. Now your lesson will be in edit mode. 6. 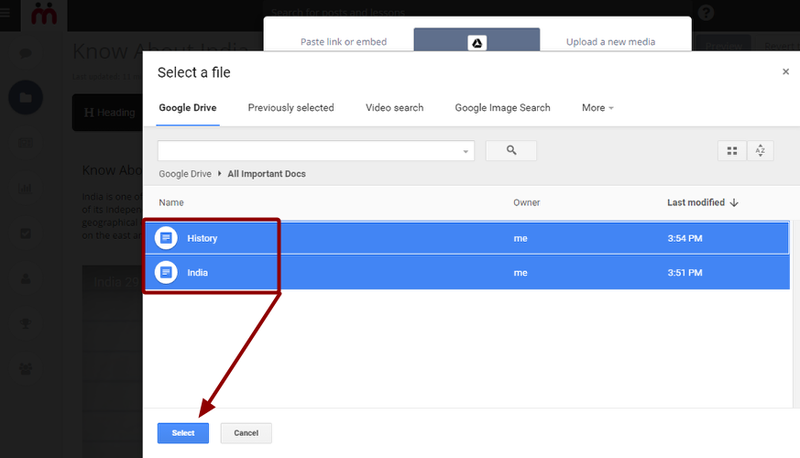 Locate the folder where you have created the Google document in your Google Drive, select the file you wish to upload and click Select. Allow View Access For Members - Users can see the attached Google document but can’t edit or comment on it. Allow Edit Access For Members - Users can edit the attached Google document. Note: Above sharing settings can also be enabled for Google Drive documents which are added in Thought, Question or Homework/Task post. If you don't see these sharing settings on your site then settings might be in disabled state and can be enabled by contacting your site administrator or Teamie Support. 8. If you wish to embed content of attached Google document inside the lesson page, then tick Embed checkbox and content rendering process will start immediately. This way learners can view the document content inside the lesson page only without opening it in a new tab or downloading it. 9. 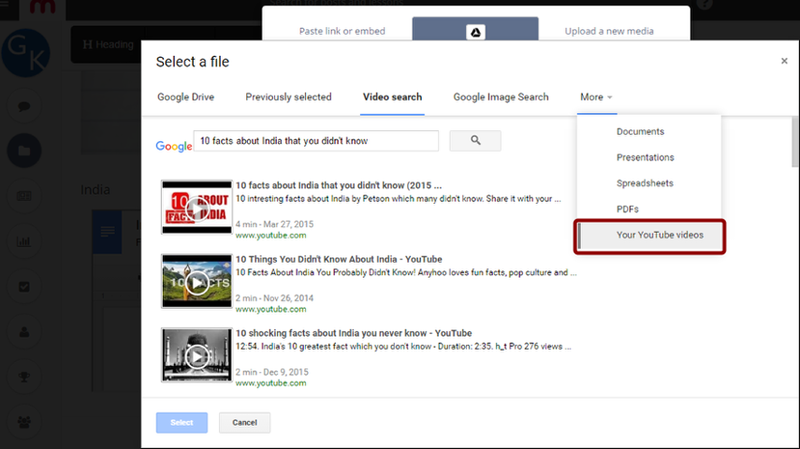 You can also search for YouTube videos within Teamie with the Google Picker. 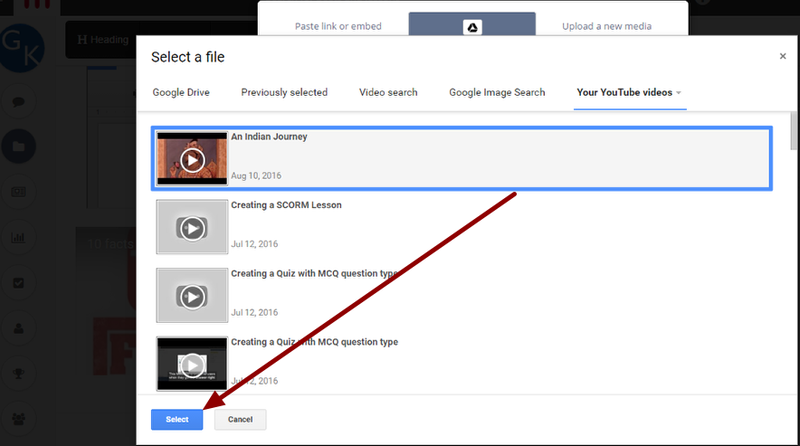 Once you've searched for the required video, you can attach those videos in the lesson page. To do this, click Video Search (1) tab in the Google picker, type in your search text box (2) and press Enter or click Search (3) to start looking for the video(s). 10. Select the video you wish to upload and click Select. 11. The video would be embedded inside the lesson page instantly. 12. 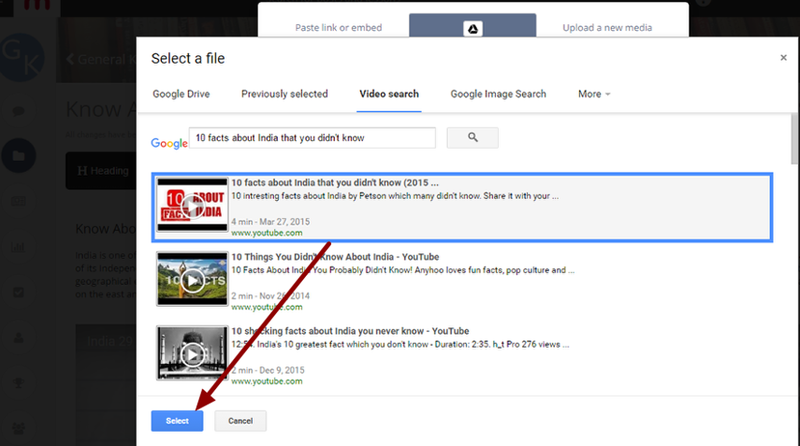 Now you can quickly add YouTube videos from you YouTube channel without leaving Teamie page. To do this, click More and select Your YouTube videos from the drop-down. If you are already signed in to Teamie with your Google account, you’ll see your YouTube videos in just a second or two. If not, then you will be asked to sign in. 13. Select the video you wish to upload and click Select. The video would be embedded inside the lesson page instantly. 14. Every change gets saved automatically. Isn't that awesome! 1. From the Materials page, click an assignment in which you wish to attach a Google document. Tip: You can filter all the assessments in the classroom by clicking the "Assessments" tab. 2. The moment you click on an assignment title, it would be shown in expanded view which allows you to edit the assignment content. Click Google Drive to pick a Google document from your Google drive and attach it to this assignment. 3. 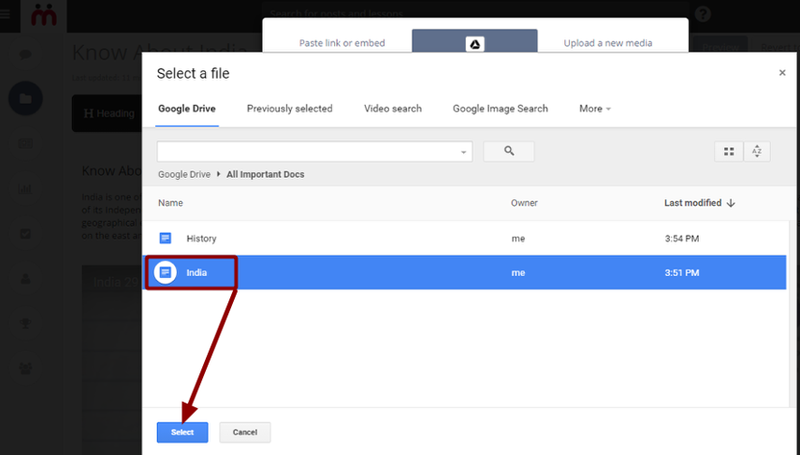 Locate the folder where you have created the Google document in your Google Drive, select the file you wish to upload and click Select. 4. Selected document gets attached in a short while. 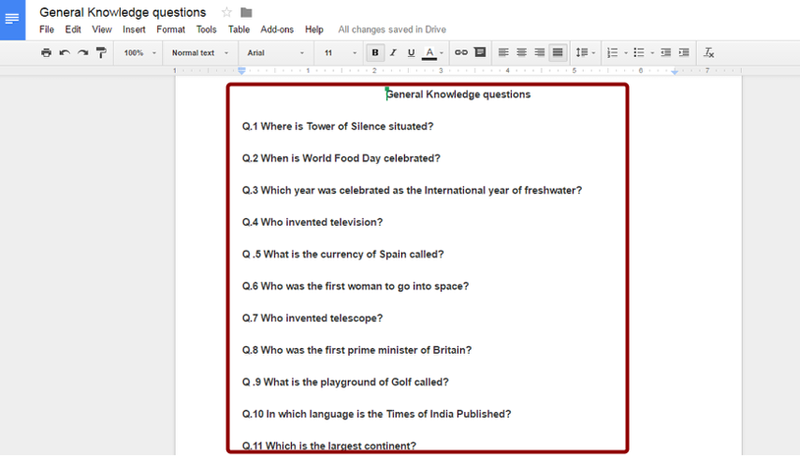 By default each classroom member would be given View Access on the attached Google document. •	Allow View Access For Members - Users can see the attached Google document but can’t edit or comment on it. •	Allow Comment Access For Members- Users can view and add comments, but can’t perform edit action. 6. If you wish to grant comment access for all classroom members on this Google document, then simply select the Allow Comment Access For Members option. 7. Now every classroom member would be able to view and add comments on this Google document. 8. 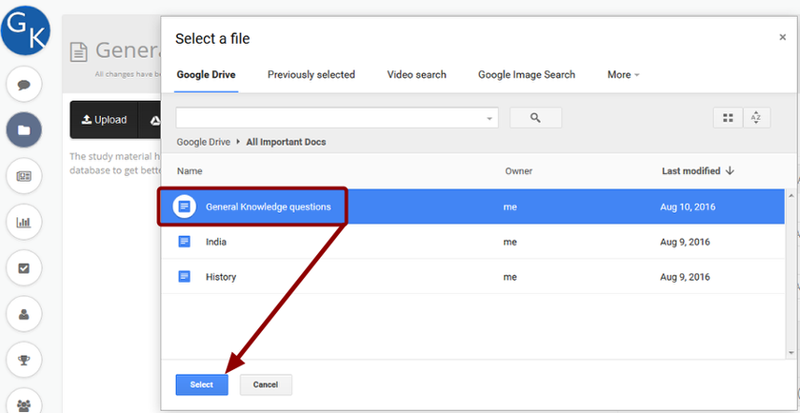 As an instructor, you can enable Lock Google Document after submission option for an assignment which restricts learner from editing their Google Document Submission that they have submitted for evaluation. It's pretty simple, just click the Submission block and then tick mark Lock Google Document after submission checkbox. 9. Every change that you make in an assignment gets saved automatically. 10. You can click the attached Google document to view its content. The moment you click on it, document opens in a new tab. 11. This way you can read the attached Google document content. A Google account, which is used for signing in to Teamie, syncs all your Teamie content to your Google Drive automatically. So Teamie content which is synced to Google Drive is organized under "Yoursite-Learning-Platform" folder. This folder contains all your classrooms and their data like lessons and assessments and such as is organized in folders. If you have access to multiple classrooms then respective folders will be created in your Google Drive. 1. By default, newly created folders are added to the root folder. Lets say you are using a Teamie site by name "Learning-hub.theteamie.com", then a new folder by the name of "Learning-hub" will be added to the root folder which will contain Teamie content. Click the folder in the root folder of your Drive to view the synced content from Teamie. 2. The moment you will click the required folder, you will be able to see other folders inside the parent folder. These folders are classrooms which are synced from Teamie and are appearing as folders in your Google Drive. Each folder will contain the lessons and assessments of their respective classroom. 3. Click the required classroom folder whose content you wish to see such as lessons and assessments. 4. Click Assessments folder to view the associated assessments created in the selected classroom. 5. Assessments folder is further categorized into Assignments and Quizzes. Click Assignments or Quizzes as per your requirement. 6. You will see a list of created assignments which are organized in individual folders. Click the desired folder to view its content. 7. You will see a word processing document which contains the assignment content similar to Teamie. 1: I can not open the Google drive file attached as a link attachment in Teamie and see a link that says “Sign in - Google Accounts”. How should I fix this? Solution: If you are not able to open/view a file in Teamie but you can open it in your Google drive, there could be a possibility that you might copied the Google document URL having private access and pasted in Teamie as link attachment in a post, lesson page. So Teamie recognizes the attached link as normal URL. Once you have pasted the copied Google document URL in a post or in a lesson page as link attachment then you will see the “Sign in - Google Accounts” link because it is not yet authorized in Teamie and same will be applicable for other users also who is having access to that post or lesson page. To avoid this you (being owner of the file) can share the Google document with public access. To share a Google document with public access, see section “Sharing a Google document with public access”. If you are not owner of the file then you can send a “request access” to the file owner, once your request is approved, you will be able to view the Google document in Teamie. To send a “request access” see section “Request access”.